Comprehensive review of My Skins Friend Organic Sunless Tanner. See what real experts and actual users have to say about this self tanning product. I gave My Skins Friend Organic Sunless Tanner 3 out of 5 stars. So I thought it was a slightly better than average self tanner. I like that it’s organic and contains all natural ingredients. This is a good one for anyone that’s allergic to certain ingredients (especially perfumes), as it doesn’t contain harsh chemicals. The application is ok, but you have to really pay attention to detail to make sure your tan turns out even. If you aren’t careful the product will pool up and cause streaks (this happened to me). The color turned out a natural medium shade, which i liked. The only thing I didn’t like about the color was that my ankles (and a few other areas) turned out pretty streaky. My Skins Friend Organic Sunless Tanner is a gradual tanner, so you’ll need to apply it 3 days in a row in order to get the final results. If you apply it only one or two days in a row, your tan will be lighter than a medium shade. I like being really dark, but for a medium shade tan, the color was nice. This one lasted about 3 days before it started to fade. As it faded it became streaky, but it wasn’t too noticeable. The price of this one is average, it works out to $4.50 an ounce. The smell isn’t good, it smells like a weird glue to me. The drying time was nice, it dried in under 20 minutes and I didn’t feel sticky or wet at all. So over all, there were some things I liked, but there were definitely a few things I didn’t like. My Skins Friend Organic Sunless Tanner is a clear spray. It comes in a pump spray, so it’s a thin liquid consistency. There’s no guide and the product goes on clear. Compared to a lot of sprays out there, this one is semi-easy to apply. It helps that there’s no guide in this spray, so it doesn’t get all over my bathroom. I sprayed this all over my body and then used a tanning mitt to blend the areas where too much product had accumulated. If you spray too much of this one, it will run down your body, causing a mess on your feet and your floor. So be careful to only spray a modest amount. The bottle says you can apply up to 3 coats at once, but I found that doing so made the product run down my body as if too much was applied at once. The spray is a pump, not an aerosol spray. So it’s a little harder to get an even application all over. Just made sure you are very careful when applying it, so your tan doesn’t streak. Also, it’s very important that you stand on a towel while applying this one, because a lot of residue will fall to the ground. My Skins Friend dried pretty fast. I’d say I was completely dry in under 20 minutes, which is a little faster than average. I liked that I didn’t feel really sticky or wet while I was waiting for it to dry. You also don’t need to worry about staining anything while the product dries, because it doesn’t have guide in it! I really can’t describe what this one smells like. But I can tell you, it’s not my favorite smell. It smells kind of like glue, which is weird because all of their ingredients are natural. It doesn’t smell like DHA, but it doesn’t smell good. The good news is the smell is pretty light. I could still smell a very faint smell on my skin the next morning, but only if I really tried. Thankfully most of the smell was gone when I woke up. My Skins Friend Organic Sunless Tanner produced a medium shade tan. The directions say to apply the spray 3 days in a row to reach your desired shade of tan. After the first day of applying I had a light tan. After all 3 days my tan was a medium shade. The medium shade was very natural and not orange at all. I had some areas that were streaky, because the product had pooled up (my ankles were the worst area). But other than that, the product looked pretty natural. I was pretty happy with the color, I just wish I didn’t have those streaky areas. Also, I’m not a huge fan of gradual self tanners as they are a lot more work. At least this one says once you reach your desired color, you only have to apply the tanner once a week. My tan lasted for about 3 days, which is on the shorter side of average. I would’ve liked to see it last another day or so, but 3 days isn’t too bad. As it faded I got a little splotchy/streaky, but the color was light so it was hard to tell. Yes, I think men who are looking for a gradual tan will like this one. The color is decent, and the product is all organic and good for your skin. Just be aware that the product doesn’t smell great, and you’ll have to be very diligent about how you apply it in order to avoid streaking. 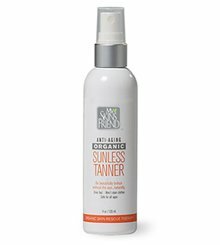 My Skins Friend Organic Sunless Tanner is $36.00 for an 8 oz bottle. It’s pretty average at $4.50 an ounce. To buy My Skins Friend Organic Sunless Tanner, Click Here. Application Make sure to stand on a towel and blend in any wet areas. Drying Time It dried in under 20 minutes. Smell (Before) Smells weird, kind of like glue. Smell (After) I could barely smell anything when I woke up the next morning. Color Produced It produces a natural medium shade tan after 3 uses. How Long It Lasts It lasted about 3 days before it started to fade. OK For Men? Yes, but only if they’re looking for a gradual tan. Price This one is an average price. It works out to $4.50 an ounce.